I realise we get new members all the time and some of you may have no idea what's going on with our indoor training. I also think it's worth updating the old hands with what we are doing in the next 8-week block. Race season is racing up on us fast, so we need to start adding some speed to all that lovely base we've been building over the winter. We'll be adding back the VO2 max intervals as the block progresses. We all remember how much fun they were! Come race day you'll be smashing it. These sessions follow less of a structured block approach than the previous two blocks, and each session stands alone quite well. While doing the whole block is best, if you can't, then dropping in and out of these sessions will work as part of your training plan. Whether you're a complete beginner or an experienced athlete, they'll add another level of quality to your training. If you've never been to a session and want to have go, you'll need to get on the WhatsApp group and put your name down for a seat. We keep spare seats for every session. Some of you will know I’ve stepped down as head coach, and some of you may have not even met me or knew I existed! I’ve been lucky to be surrounded by a group of extremely knowledgeable and passionate coaches, so it’s very much been a team effort. 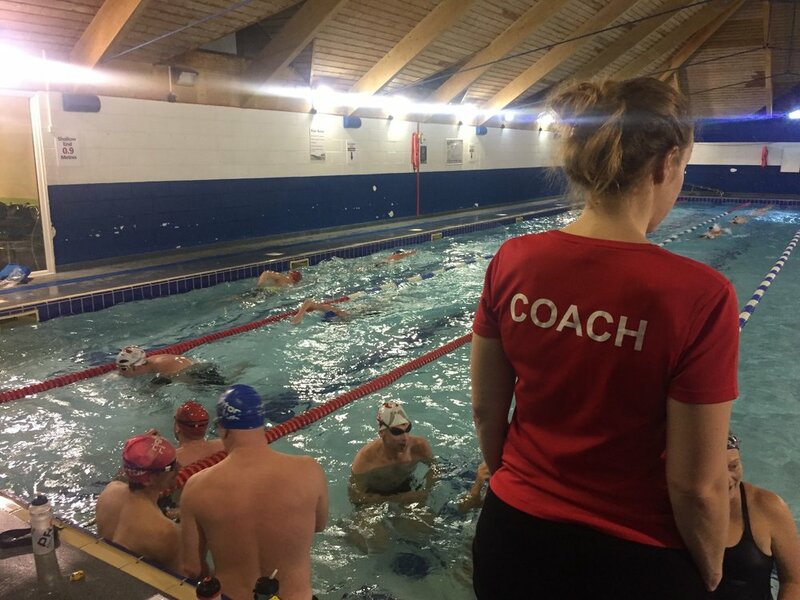 We are lucky to have a large number of qualified coaches in the club (10 level 1, 10 level 2 and 1 level 3 British Triathlon, 4 triathlon activators, 2 British Cycling coaches and 2 England Athletics coaches! ), expecting two new British Cycling coaches and two new triathlon coaches in the autumn. One of the challenges of a club of this size (currently 200+ adult and 50+ youth members) is to provide appropriate coaching for our members at both ends of the spectrum: those new the sport and keen to dip their toes into the water of triathlon for some fun and enjoyment, and those at the sharp end of competition, heading off to World Championships representing GBR. Not only that, but triathlon gives us a range of distances from supersprint right up to ironman distance. It’s not an easy task to achieve! I like to hope we achieve our goal, providing something for everyone. 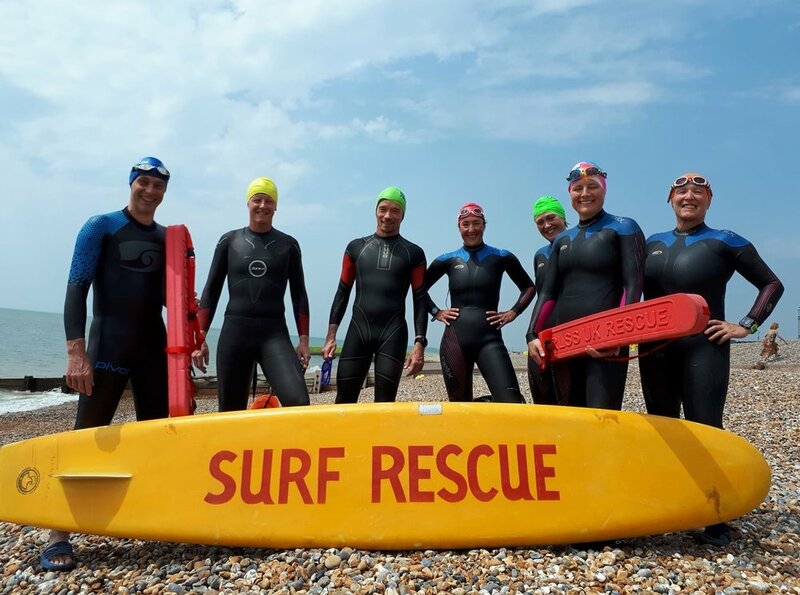 One of the things I’m proud we have achieved this year is getting our coached open water swim coaching (affectionately known as COWS) running regularly throughout the open water season, as well as 4 novice sessions for British Triathlon. 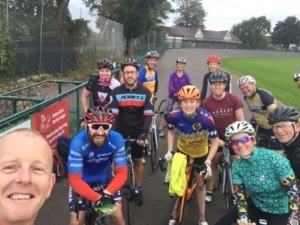 We’ve introduced the immensely popular MyRide sessions, regular Sunday road rides and trail runs, and a weekly presence at the track for focused run technique and fitness. 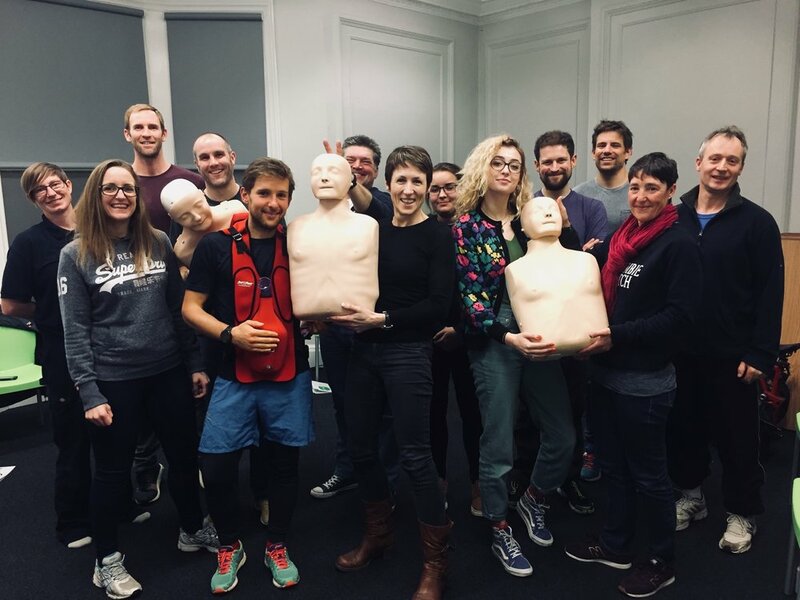 I have also organised coach education, with workshops by Fiona Ford from Swim Smooth, and open water swim safety skills and first aid education delivered by Susan Reynolds from Blue Response. None of this would be possible without our wonderful volunteer coaches- don’t forget all our coaches turn up in rain and wind for the love of the sport, and the satisfaction of seeing you turn up, train, improve and achieve things you maybe didn’t think possible. The coaches all want to train and race as well. If you’ve learnt something or achieved something thanks to our coaches, do remember to share it with them at the next opportunity! What have I learnt as Head Coach? Although I achieved a few things, there were lots more things I would have loved to integrate but ran out of time in the day. Yet again I remind myself that what I think could be possible with my time, and what is actually achievable are different things. I found it’s impossible to coach regularly and focus on your own training plan. My training became ad hoc and unfocussed. I decided to enter sprint distances this year as it was easier to fit in around unstructured training. Somehow that plan worked and I enjoyed not having to worry about time or distance when training, I could just enjoy exercising and being outside (or inside with music for MyRide). I think it’s easy to forget when we have a very structured training programme that we do this to enjoy it- none of us are professional athletes trying to make a living from sport. Sometimes it’s nice to leave the Garmin/Polar/Suunto at home and go and enjoy the scenery and social time. Lastly, a big thank you to cycle lead coach Rick and run lead coach Ian, and my right-hand man Sir Chairman Swickers and of course ALL our amazing coaches. I won’t disappear completely, I’ll still be along to coach and train (with or without my Garmin). I love Brighton Half marathon and sign up every year. I figure it will motivate me to train well through the winter. I haven’t actually raced it for two years due to illness, and in fact, I haven’t run that distance either for two years. During training this year I realised that I had forgotten 13.1 miles is actually a long way! Training went OK, and I kept injury-free. Cathy mentioned she was hoping to get round in less than 2 hours for the first time, and I offered to help pace her. Or maybe I told her I would pace her. I’m normally around the 1 hour 50 mark, so felt confident I could help Cathy with her goal. It actually felt good to take pressure off myself to try and achieve my own PB- the only thing I had to concentrate on was making sure we both got round in 1:59 or less. I formulated a plan. Having seen Cathy at a ParkRun recently, I knew she tended to start too fast, and then fade towards the end (which we all tend to do). My plan was to, therefore, start slightly slower than she wanted to run it, and then slowly increase the speed. I planned for us to start at 5:40/Km, which would bring us home in 1:59, but if Cathy felt good I’d try to get us to 5:30/Km. Brighton blessed us with beautiful if slightly chilly racing conditions. TopTip: Disposable hand warmers inside your gloves. We started out slightly faster than I was planning- this is usual for races as you feel great after your taper AND you are surrounded by a mass of fast running people, so you go into wild stallion/mare mode and keep up. I reined us in a little and then we settled into a nice steady pace. I used a lot of internal and external cues with Cathy. Getting her to tune into how she felt was our first step- Comfortably uncomfortable was the goal. It’s a pace that means you’re running hard, but not so hard that you’re going to suffer later on. You should be able to keep going. Save uncomfortably uncomfortable for your ParkRun PB! We then locked into our 5:30/Km pace- once you have that comfortably uncomfortable speed, it’s really important to mentally ‘lock-it-in” and stop thinking about it. We saw lots of BriTri supporters through the course, which really boosted us, and the miles kept being ticked off at our metronomic pace. Getting to mile 9 and things started to get tough for both of us. Clearly, I wasn’t about to mention my niggly hip and calf! I used some external distractors, which Mike Porteous taught me. The "sense-ational" running technique: every few minutes you concentrate on one of your 5 senses. What you can see (blue sky, sun, yippee! ), what you can hear (cheering, clapping, awesome drumming band), what you can smell (ahh, the sea! ), what you can feel (my comfy new runners, forget the hip niggle!) and finally what you are going to eat when you finish (roast+pint). We hit Hove Promenade, and unfortunately the last 5 Km was into the Beast from the East headwind. Cathy tucked in to draft behind me, and I tried picking up the pace to 5:20/Km. A little chirp from behind me: “You’re getting faster! I can’t go any faster!” “No, I’m not! Stay with me!” Nevertheless, I knew we were well on target for our goal, and cruised down the final stretch to cross the line in a formidable 1:55:56. Cathy was obviously elated, and so was I. It was a really enjoyable race, and taking the pressure off myself to achieve was really interesting. Clearly, I still had pressure on myself to ensure we got in under 2 hours, but this was a different pressure. It really felt like a team effort and was still challenging in its own way. I really enjoyed the planning, and to see the plan executed perfectly was really rewarding. The pint and the roast afterwards were the best. So, if you fancy a different but hugely rewarding challenge, try pacing someone to a new race PB. It might teach you a lot about your own pacing strategy. I was fortunate to have Rachel as my pacer for the Brighton half marathon. I have been trying to finish a half marathon in under two hours for the last couple of years, the closest being 2 hours and 45 SECONDS. Conveniently, I forgot my Garmin watch on the day, so was reliant on Rachel for timings. I knew I needed to do approximately 9-minute miles, but usually running in min/km I didn’t know how much that was, so I basically left the clock-watching completely to her. I think the most notable thing for me was that we started at a very measured pace and kept that going. Having Rachel there distracted me from looking at how many people were overtaking me in the beginning (Rachel’s note: we then proceeded to overtake loads of people through the rest of the race which gave Cathy a real boost). I have a tendency, as a lot of athletes do, to go out too hard then get knackered at about the halfway and lose pace. 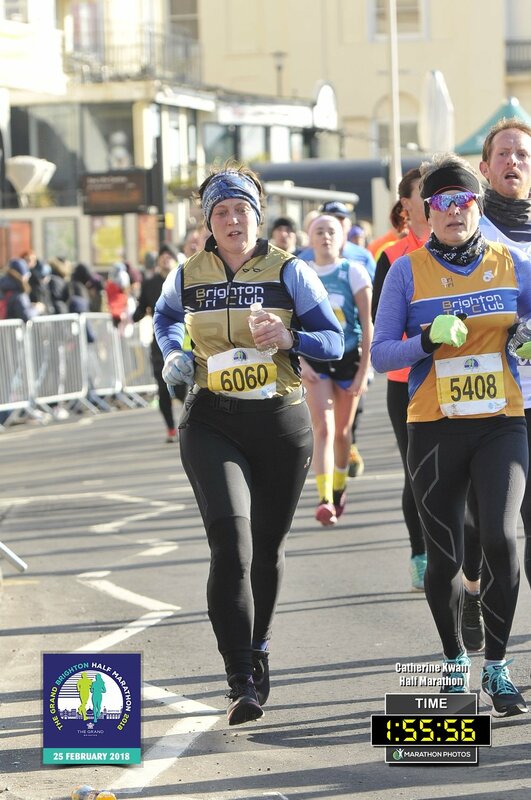 My concentration has a tendency to wander (such as when watching seagulls or waving at people), and I slow down, but Rachel kept the pace steady over the whole 13.1 miles, except the last two miles when she increased the pace (thinking I wouldn’t notice but I did). We ended up finishing in 1:55:56, which I am still chuffed about. It was a really valuable lesson in how to keep a steady pace for the whole race and stay focused on the race I was running. I don’t think I would have managed it as successfully myself, so am very grateful to Rachel for helping me crack the two-hour demon! 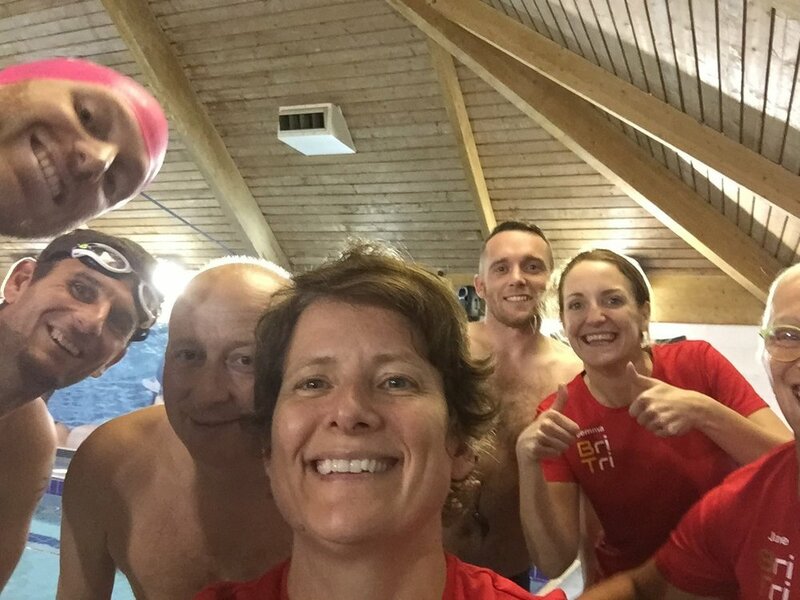 For those of you who came to a coached swim session this week, you may have wondered why we had a whole hour dedicated to technique. It can feel frustrating when you want to improve your swimming speed to spend time swimming slowly, concentrating purely on technique. Surely, to swim faster you need to practice swimming faster? Sadly, this is not the case. If you have technique limiting factors, you will reach a ceiling with your swim speed, no matter how fast you swim in training. In fact, you’ll be reinforcing that bad technique with every stroke! If you want to swim faster you have to ensure your technique is good and your stroke faults are corrected alongside sessions to improve your speed and endurance. Even our speedy swimmers in lane 5 have factors that can be improved, which will unleash even faster-swimming potential. 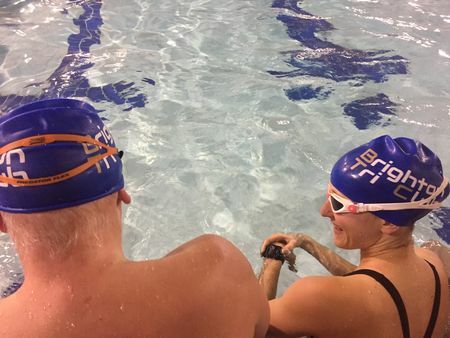 Performing a pure technique-centred session allows you to slow down and really concentrate on specific aspects of your stroke. Concentration is vital- you really have to think about what your body is doing, feel how the water moves against your arms and legs, and visualise how your hand enters the water and starts the catch. What better way to forget about that horrendous day at work! If you’re not sure what perfect technique actually looks like, you can download the Swim Smooth app for free. This allows you to visualise Mr Smooth swimming from all angles and at all speeds. Don’t worry, we’ll be back to endurance and CSS sets at Wadurs soon! Rest, the art of doing nothing. The biggest myth in endurance sports is that training makes you fitter and faster. It doesn’t. 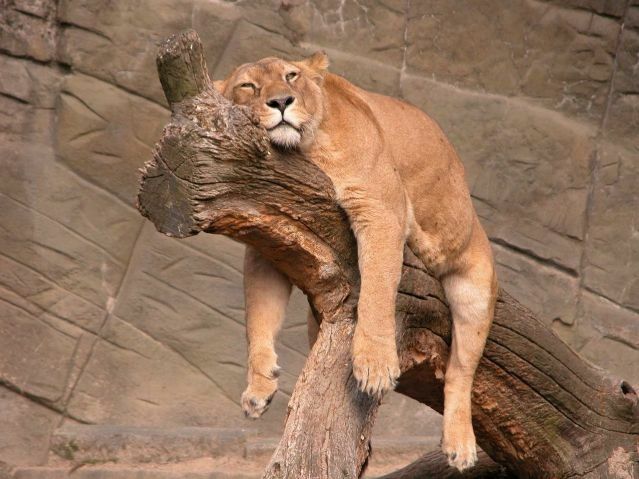 Training makes you tired, damages your muscle tissue and depletes your energy systems. No one ever finished a 10km run and thought “wow, I feel stronger than when I started”. If training made you fitter, then doing 12 hours a day, 365 days a year would be the answer to all our weaknesses. The truth is, rest makes you fitter. The part in between training makes you stronger, faster and better adapted to your goals. When training you apply stress to your body in a variety of different ways. When you stop and rest, the magic elves in your body run around and fix the things you’ve broken. While they’re at it, they make a few adaptations to make you better for next time. If you don’t give yourself enough rest, the elves don’t have enough time to fix you, and your body won’t make the adaptations it needs. Successful training is stressing the body to ask for adaptations then allowing time for your body to make them. 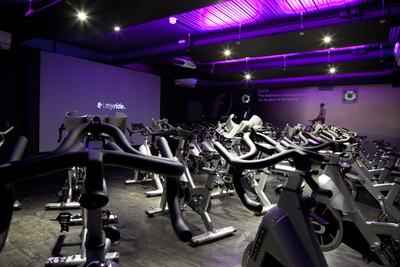 If we’re honest, we all think if we’ve sat still for ten minutes we’ve lost fitness. We think all our competitors are out there running, swimming or biking their way into beating us. 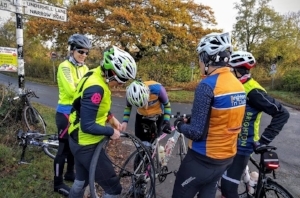 Social media doesn’t help either, Strava league tables and photos of club mates churning out the miles while you’re sat on the sofa eating Doritos. Unfortunately, when we train hard and don’t recover properly, we find our performance stagnating or going backwards, this can lead to a vicious cycle as the solution seems obvious. Train more. We can all see how that works out. The reality is that most of us would probably be faster with a bit less training and every bit as fast with a lot less training. Or to put that another way, we’d all be faster with a bit more recovery and a lot more recovery wouldn’t do us any damage. If you combine that extra recovery with an increase in training quality, you are on to a winning formula. Less Junk, more quality, better recovery. As Shane Sutton liked to say, There’s no such thing as overtraining, just under recovery. So how do you do recovery? Realistically, unless you’re an elite level athlete, a young athlete or a pro, recovery means doing nothing. Pros might do recovery runs, swims and rides but for most of us, particularly masters athletes, recovery should be doing as near to nothing as possible. Let’s be honest, how many of us are disciplined enough to do a proper recovery paced session without misbehaving. Obviously, life gets in the way but remember Pros don’t do full-time jobs and recovery runs. They don’t spend the day looking after the kids and shopping before a recovery bike. They sleep half the time, get a massage, drink a few Kale smoothies and head out for a recovery swim. If you’re not a pro, take a nap in front of the fire instead. My favourite rest motto is “don’t stand when you can sit and don’t sit when you can lie down”. Don’t wait until later to start recovery though. Recovery starts as soon as training finishes. You need your nutrition ready to go as soon as you stop. If you finish at home that’s easy. If it’s one of the club sessions, bring it with you. You need to feed your recovery elves. A small amount of protein and some carbs within the first 40 minutes is the biggest helping hand you can give yourself. Don’t wait! Finally, plan for it. We’re all great at planning what we’re going to do but how many of us are planning for what we’re not going to do? Have a look at your training diary for the last few weeks and the next few weeks. How many rest days are there? How many of you got halfway through your last rest day, panicked and went for an “easy swim”? Plan some proper rest into your schedule. Make it specific. Make sure easy days follow hard days and easy days precede your hardest breakthrough workouts. You can’t do a massive power interval workout the day after a 100km tempo ride. Your rest days should follow your breakthrough sessions. Whether that’s a Parkrun PB attempt, a 10km race, your first 4km swim of the year or a big hills session on the bike. Those days when you are looking to progress to the next level need to be followed by time to adapt. It might mean having to miss out on some of the club sessions or an event here and there, but you’ll be stronger and faster for it. So be realistic about yourself and your level of discipline. Get quality nutrition at the right time and plan some regular rest into your schedule. If you do this, it comes with a go faster stripe.